You are here:Home » Promotion / Events » Reverse The Effects Of Aging With Restylane Dermal Fillers! 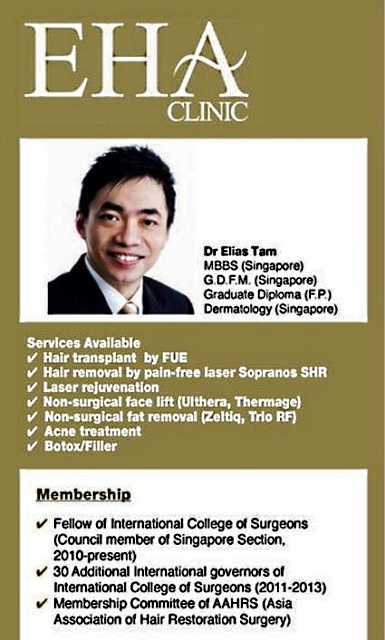 Well known internationally as a Speaker at #Aesthetic Medicine conference & a specialist trainer for various laser & filler treatments & applications, Dr Tam of EHA Clinic is one of the Governors of The International College of Surgeons & a committee member of The Asia Association of Hair Restoration Surgeons. #DrEliasTam is also at the forefront of developing & testing the latest in hi-tech & innovative aesthetic procedures – with particular expertise in follicular hair extraction techniques for hair transplants, & facial skin therapies. #HyaluronicAcid (HA) is a naturally occurring substance in your skin that helps provide fullness & elasticity. As we age, skin loses HA. As HA diminishes, skin loses volume, increasing chances for wrinkles & folds to appear. #Restylane is the most popular hyaluronic acid filler word wide & can be used to add volume & fullness to the skin to correct moderate to severe facial #wrinkles & folds such as the lines from your nose to the corners of your mouth (nasolabial folds). Restylane is also the first & only FDA-approved #dermalfiller for lip enhancement in patients over 21 years. Hyaluronic acid is a substance that is normally produced by the body; it is what gives skin its volume & fullness. The hyaluronic acid in Restylane is called non-animal stabilized hyaluronic acid (NASHA) because it is not derived from animal sources. When Restylane is injected into wrinkled skin it adds fullness & reduces the prominence of the wrinkles in the previously wrinkled area. Hyaluronic acid also attracts & binds water, & this also helps maintain fullness in the area of injection. Over 10 million treatments with Restylane have been performed worldwide, making it one of the world’s most widely used hyaluronic acid based aesthetic injection treatments. The hyaluronic acid in Restylane is non-animal which means that no skin tests are needed & that there is a minimal risk of allergic or hypersensitive reactions. #Emla, a numbing cream was applied onto mom's cheeks for 30 mins. Procedure took about an hour for mom. Restylane was injected into the skin in small amounts using a very fine needle. Restylane from #Qmed was used. In order to help replace the loss of volume for each layer, the thicker #Perlane was used for the deeper layer, Restylane for mid & soft & hydrating #RestylaneVital for superficial. This recreate a more natural look as it mimics the natural layer of the skin. Just like Restylane, Perlane adds volume & fullness to the skin to correct moderate to severe facial wrinkles & folds, such as the lines from your nose to the corners of your mouth (nasolabial folds). Restylane Vital products improve the elasticity & texture of skin, & restores & maintain the skin hydrobalance. A thin layer of antiseptic cream was applied. There is no down time. Restylane products are biodegradable, which means they will naturally disappear in the body. A follow-up treatment is usually needed after 6 to 12 months depending on individual factors & area treated. After a treatment some reactions might occur. Most common is slight redness, swelling, itching, bruising, pain & tenderness. The reactions are generally mild to moderate & usually disappear shortly after injection. They usually resolve spontaneously within one or two days after injection, but for some treatments they may last longer. Look at the volume on mom's cheeks! The results can be seen instantly. Restylane is a natural beauty product that does not affect facial expression or movement. A treatment with Restylane will generally last 6-12 months, & with only one re-treatment, the effect has in a recent clinical study been shown to last up to 18 months. To maintain the results in the lips, a re-treatment is usually needed within 6 months. Avoid touching the area to prevent infection through the needle hole for the next 4 hours. It is good to avoid alcohol & other blood thinning chemicals such as aspirin, evening primrose oil, omega oil, & excessive heat. Check out the clip below for more shots! Although mom had commented that the pain was almost insignificant, but she was really nervous. I would be too, after all, I fear the needles. Dr Tam had been extremely patient throughout the entire treatment, as well as attending to my queries. Visit EHA Clinic now for your consultation! Dr Tam, is awfully approachable, relaxed & assuring during both consultation & procedure. My mom & I were completely at ease under his skilful hands. 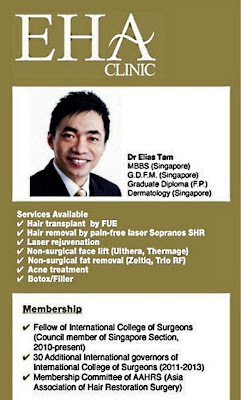 First time customers from now till end of Sept 2012 - Fillers from S$600 (usual S$800). * S$600 (depending on brand, place used, age of patient, state of skin etc). Like mom, who is more matured, she had to use more expensive fillers. See it in the news! 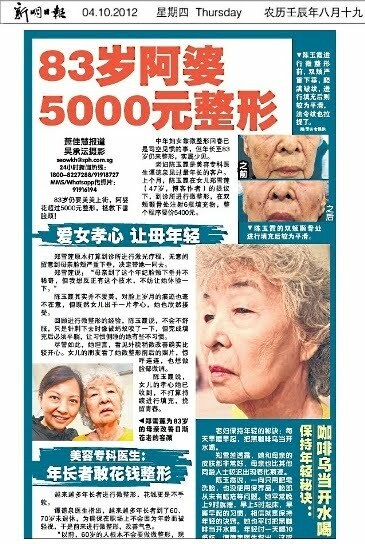 Here's my mom, appearing in the Chinese #XinMin newspaper. Akila, thks for your wonderful note! Lizzy, kudos to her :) Thks, dear! missyblurkit, I'm impressed too. Lol! Your mum is lucky to have a daughter like you to pamper her with treats, and vice versa, you are lucky to have your mum who is all brave up to try this and allowing you to video her throughout and sharing here. Aunty! Bravo! Does it provide any treatment to cure pigmentation on the face? Curious. 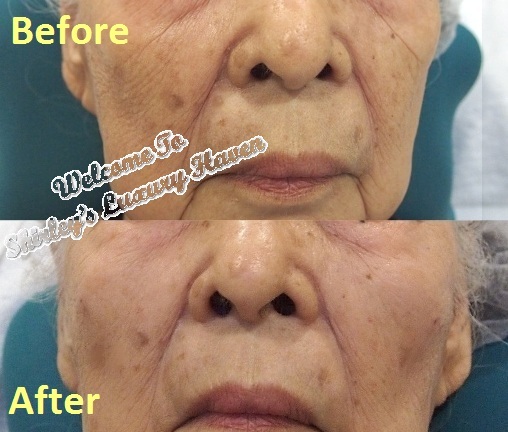 Evelyn, for pigmentation, stay tuned for my review on IPL/Laser. Kudos to your mom for sharing this experience. She always looks fresh like a daisy. Edmend, amazing, isn't it? Enjoy your weekend, dear! Seems like quite a bit of money for something that doesn't last that long. I don't know that I'm as brave as your mum! Can they knock you out completely first? YL, that's called 'the price of beauty'! Hahaha! Me too, I'm so scared of needles. Probably gotta knock me out too. Mom went for cataract operation sometime ago & she was also awake the entire time!! wow..remarkable and informative on the HA cells..can really see the effects on your mum's cheek..
Hong, mom will be most delighted to hear that :) Enjoy your weekend! Amazing results I must say, your mom must be a really satisfied customer! Very brave of her, I am afraid of needles too! Jeannie, I admire her for her guts too. Hahaha! Reana, hahaha! She's totally cool! U're so adorable, dear. Your Mom looks really adorably cute :) And following you from now on!! The difference is obvious before and after. I suppose with money, anybody can turn back their age and look younger with all these treatments which are getting very popular. Kathy, hahaha! Be sure to KIV this treatment for your wrinkles concern. Hartina, thks & God bless u too! Glad you've found it informative! Have a great day!